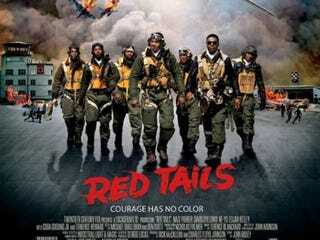 Red Tails flying high at box office: The film had a robust debut this weekend, claiming the No. 2 spot by bringing in more than $19 million at the box office. George Lucas said before the film's release, after noting Hollywood's reluctance to back a high-budget project with an all-black cast, "If we can get over $20 million in our first weekend, we're kind of in the game. We're in The Help category." Pretty close. The next story to watch will be the impact of this success on similar films. Jewish paper apologizes for Obama assassination suggestion: Andrew Adler, the owner of the Atlanta Jewish Times, has apologized after suggesting that assassinating President Barack Obama is an option that the Israeli government should consider. Seal and Heidi confirm divorce: "While we have enjoyed seven very loving, loyal and happy years of marriage, after much soul-searching we have decided to separate," the parents of four said to People magazine. EU imposes new Iran sanctions: The European Union on Monday announced a ban on the import of Iranian crude oil and petroleum products, as well as a handful of other sanctions, which, as reported by CNN, include freezing the assets of Iran's Central Bank in the EU; banning trade in gold, diamonds and precious metals; and stopping the export of "key petrochemical equipment" from the EU to Iran.